I have originally dismissed this design as incoherent (or should I say “dissonant”? ), and while I continue to stand by my impression, I found the theme intriguing enough to merit a critique. 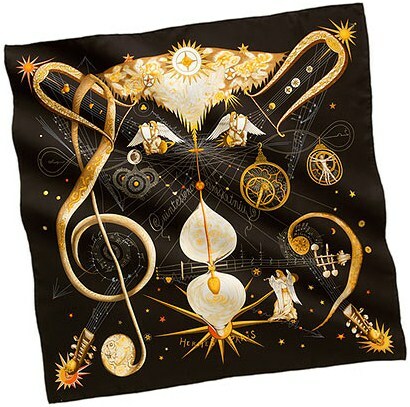 The title of this scarf is “Quintessence”, a direct reference to the mystic concept of the fifth element that defines our universe (throughout the human history, various cultures identified the four elements that together made up the physical space in which we live as “air”, “earth”, “water” and “fire”. Given their critical and intimate roles in our lives, they were referred to as “essences”; hence, “quintessence” – from the Latin “quinta”, meaning “five”, and “essentia” – “essence”). In the classic science fiction movie with the same name, the fifth element that bound us together was love; in the world depicted by Zoé Pauwels, it refers to a movement of fantasy and mystery, describing the Genesis through music played by angels (similar to a previous design, by the same artist, called "la danse du cosmos"). With many large-sized elements, the focal point of this score is the ornate treble clef (also known as the “Sol” clef, the name of “G” in the solfege, whose shape is probably derived from a cursive “S”), to the left, juxtaposed with the equally ornate bass cleff on the right (the word “solfege” ultimately derives from these two syllables, “sol” and “fa”). They set the tone for the overall theme and invite the spectator to tune in to the other elements of this creation. As my gaze sought the rest of the carré, I found myself overseeing the white object depicted in the lower half of the centre, and up towards what appeared as celestial skies. On closer inspection, however, I recognized an hourglass whose passing of the sand from one receptacle and into the other, measuring the passing of time, is perhaps reflective of the rhythm of music and life. The celestial skies may also carry the admirer – as in a fantastic world – to our galaxy, as a reflection of the universe that music creates – its place, at the top, perhaps not random in suggesting that music is indeed uplifting. In the lower corners of the scarf, music springs out of the necks of two violins, as if to indicate that the substance of the cases themselves evaporated into the ether (the fifth element) and what’s left is the music. The upper corners echo the lower ones with harps – the instruments of the gods – from which music continues to flow in an enchanting way. Each of these instruments – real or imaginary, as if in a fantasy – rest on stars that shine over all creations (remember, the light is the most powerful and recognizable symbol of the Divine). 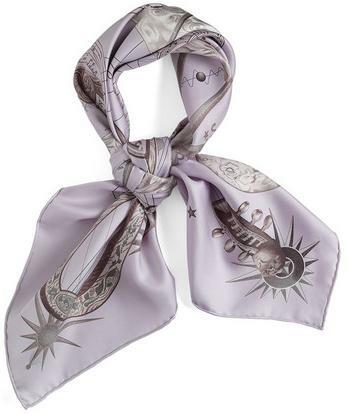 Perhaps the most impactful are the two celestial stars along the main “North – South” axis of the scarf, appearing to shine brighter than any other. Potentially missed during the first “interpretations”, each of the two angels in the upper half of the scarf are resting on the Sun and the Moon, perhaps symbolic of the beginning and of the end. Finally, take note of the existence of the astrolabes, signifying the human poise to reach beyond the visible limits of our world, to discover and explain the universe. The design is not necessarily harmonious, but is arguably maintaining an internal equilibrium, suggestive of a moment suspended in space when the motion of the stars may be observed and appreciated. The final word is that Pauwels' style is distinct enough as this design reminded me of "La Musique des sphères", most recently released in 2007. Last night I had the great pleasure of meeting Mireille Guiliano, renowned author whose claim to fame came from her intimate involvement with Clicquot Inc., the owner of the Veuve Clicquot champagne (as the firm’s then-CEO, she is credited with resurrecting the brand, achieving double-digit sales growth year after year, and ultimately claiming 25% of the market of high-end champagne consumers). The context of my meeting her, however, had less to do with bubbly and more with her efforts to promote her new cookbook, entitled – stirringly – “The French Women Don’t Get Fat Cookbook”. I must confess I didn’t know much about the person, and less so about the content of the book, but her charisma and her encouragement for healthy eating aroused my curiosity and interest, so I went to the book-signing event in Toronto last night. Marvelous person (“un phénomène”, as I’d say in French) ! Her secret – wholeheartedly healthy, I’d add – is to have smaller portions, a strict three-meals-a-day regimen and embrace wholeheartedly culinary diversity. In fact, she is quick to point out that attitudes, above behaviours, must changes: people (note that I don’t restrict the term to just “women”) should consider cooking an act of love, where the results are immediate (unlike a business activity, which may yield results over a much longer period of time). Anyway, what best to describe the experience than by offering a luxurious glimpse into the French cuisine? “A la gloire de la cuisine française” (“to the glory of the French cuisine”) is an ode to the many creations that continue to fascinate gourmands and general folk alike (Mireille insists meals should not be gulped in 5 minutes, as the brain requires about 20 to process that the body is satiated and hence the quick meals turns into added calories – besides, where is the pleasure of having and indeed savouring the meal?). 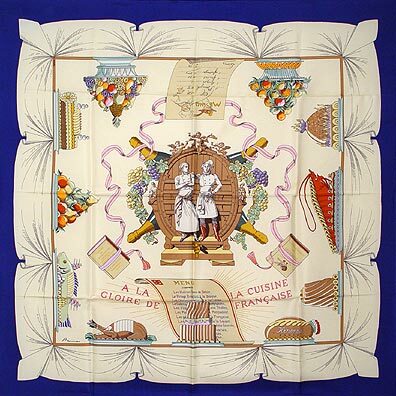 This scarf, designed by Robert Dumas (related to the founding family of Thierry Hermes by association and the first non-descendent leader of the firm) was issued in 1942 and reissued in 1989, followed by a 2005 all-cotton (70cm) version. Despite some elements that reflect that era (such as the folds in the table cloth – the gourmet items are layed out onto a clothed table – , which, by now, would give an impression of “out of fashion”), the appeal of this scarf continues. Of particular interest to me is the “sparse” design; unlike many other scarves, this one features elements that support the theme laid out as if served – independently – at a dinner table … so participants enjoy the entire experience fully. If cooking is an act of love, should we not employ all our senses to savour the experience ? Typical Hubert de Watrigant, "Les Poneys de Polo" ("The Polo Ponies") uniquely captures the noble animals during both games and their time off. While the creativity is readily apparent, the originality of this "canvas" is not. In fact, this design struck me for how much it resembles last year’s “Chevaux Qataris” (“horses of Quatar”) and 1987’s “Monde du Polo” (“World of Polo”, reissued in 1998). The two previous designs’ “love child” ? Perhaps… Yet, it would have been much more refreshing to harvest the pony theme in a different … fashion. Nevertheless, based on its own merit, this scarf is quite dynamic thanks to the ponies in motion (and to the jockeys in various positions). More, the background lines, each of a different width and all horizontal as if parallel to the “ground”, further enhance the dynamism of the design. 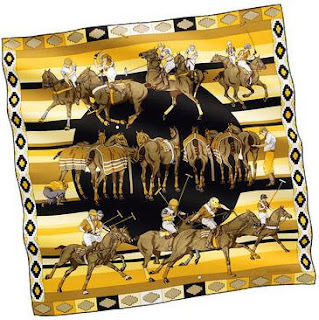 Finally, the patterns all along the scarf edges - reflective of the Argentinian belts (in recognition of the small, muscular, wiry and agile ponies, typically Argentinian) - add a certain playfulness that enhances the free spirit of the players. 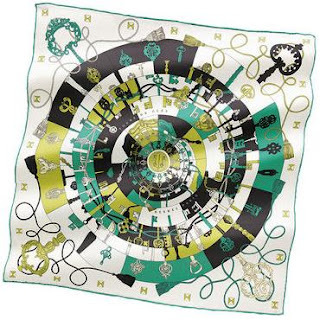 The colour combinations are quite contrasting, more of an exception rather than the rule when it comes to Hermes designs. In this case, yellow, cream and dark brown, next to each other, bring forth a vibrant undertone (perhaps reflecting the palpable tension during the games). Unlike many scarves, that are quite versatile in terms of being matched (or complimenting) diverse patterns, shines, colours and textures, I’d be inclined to pair this one with a monochromatic blouse, unless it’s worn as a more “discreet” accessory, such as in lieu of a belt, or as a bandana. Undoubtedly a statement scarf ! This scarf is a reinterpretation of the the "Keys" design so successful, so popular and so beloved in the House's collection. I consider the colour combinations unconventional in that they manage to be interesting without necessarily being top-of-mind when one thinks of combining some colours. The circle motif, adopted as the background of this scarf, brings a certain energy into a pattern, yet another element that contributes to the contemporary effect of this design. This scarf pays tribute to the remarkable Lake Geneva and, in particular, to the memorable times visitors and locals alike are inspired to have. Lake Leman (the French name of Lake Geneva, whose shores are shared by Swiss and French) has been a symbol of high-life, of an oasis and of an unperturbed atmosphere whose waters are crystal-clear (as a testament to the care about the environment and the high standards of quality adopted by Swiss and French alike). "Sur les rives du Leman" ("On the shores of Lake Leman") has been realized in the impressionist style, with silhouettes in lieu of picture-clear depictions of people - just as someone would remember after years following a particular event. 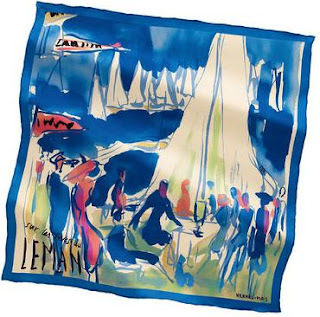 The sail, forming the focal point of the scarf, may also be suggestive of the "jet d'eau", the large fountain and one of the City of Geneva's most famous landmarks, that jets from within the lake high up, making it one of the tallest fountains in the world. Just as my memory of 2005 of the main shopping street in Zurich on a lovely autumn Saturday, when folks dressed up with hats, furs and walking canes were enjoying the beautiful weather, the characters depicted in this design appear dressed elegantly for their "time out on the city", which adds further character to the "canvas" itself. 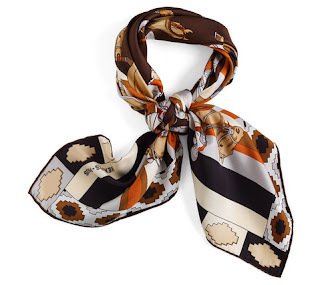 Finally, the scarf was issued in the "vintage-style" silk, in 70 cm x 70 cm. The technique that renders the "picture" so lovely is unfortunately lost when the scarf is knotted, making it appear more like an ordinary scarf than anything extraordinary the Maison is known to have produced in the past. Yet I perceive this design as a lovely exploration and experimentation.